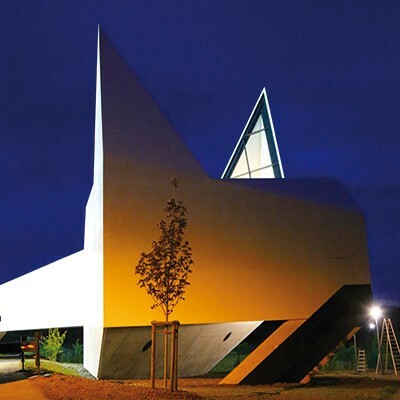 The ecumenical motorway church in Siegerland, Germany, consists of the church itself and an access bridge. The design is characterised by its abstract external shape and a spacious interior, which is derived from a spherical volume. Through specifically modeled shafts the daylight is indirectly channeled into the church and thus supports the room’s mystical character. The substructure is a mezzanine level which houses the mechanical equipment and whose sloping walls taper towards the foundation. The upper level of the church is a lightweight timber structure, whereas the substructure and foundation consists of reinforced concrete. The access bridge, also a timber structure, is spanning between the church structure on one side and a conventional bridge abutment on the opposite side. 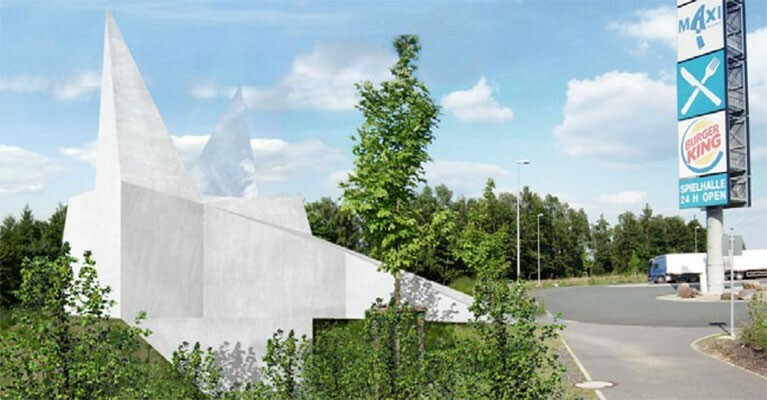 The motorway church Siegerland is just 70 m away from the A45 motorway. The timber frame construction posed a particular challenge for the sound insulation at the given distance to the motorway. The transparent openings in the church were positioned in an optimal way by means of a light study and thus support the striking architecture. The acoustics, dominated by the inner dome (sphere), ensure the spatial feel of a church, overshadowing the size of the space.